I love checklists. They break down very detailed processes into actionable, step-by-step items. I try to create them for every recurring project I do so I don’t miss a beat when the task comes around again. The same goes for publishing content. 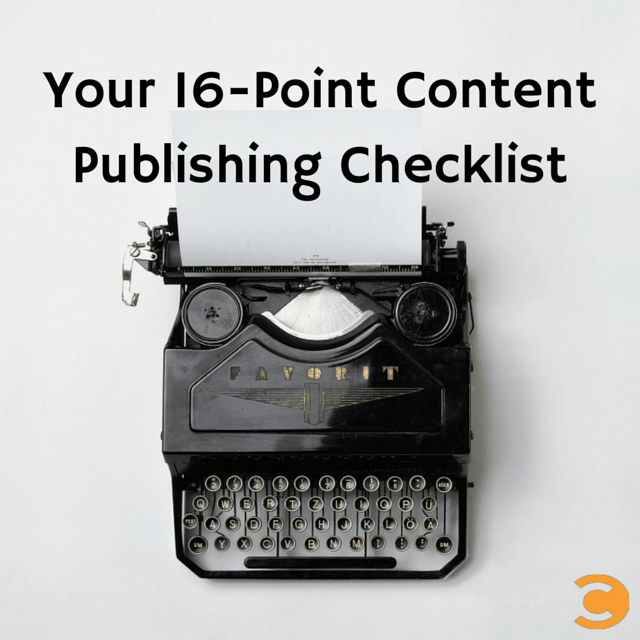 With so many moving parts that take place even before you press “Publish,” a checklist can seriously come in handy. Here are my top 16 items to check before you push your content live for all the world to see. Does your title have the power to entice a reader to click through? Generate multiple ideas for titles based on your topic to see all the different combinations and angles you can take. Then test it! Ask a colleague or friend which one stands out to them most and why. Does my content have a main takeaway? What do I want someone to take away from reading this? Do I prove my main point through my supplementary arguments and examples? Taking the last checklist item a step further, now you must ask, “What do I want my readers to do?” Maybe it’s as simple as read and learn, or leave a comment, or maybe you have an action you want them to take, like download a free guide or register for a webinar. Think through the steps that need to be followed to implement any further action that takes place beyond your content. Hopefully, you’ve asked this question even before producing the bulk of your content, but it’s helpful to add this to your pre-flight process anyway. Any piece of content should foot back to your strategic goals, but more importantly, it should always be useful to the audience you’re hoping to reach. As Jay says, smart marketing is about help, not hype, and useful content is the way you align your marketing with that vision. We’ve all had those cringe-worthy moments when we see a typo or two in a blog we just published. How could we have missed that?! Sometimes we have a macro perspective on the blogs we’re working on, so we have to take a moment to go micro and look at the details. Double check your spelling, punctuation, grammar. Reading your work out loud is also helpful to hear the flow of your piece. Reading content online should be easy to read, scan, and view on different devices. Play with formatting like bullets, numbered lists, quote call-outs, and sections. You don’t want to overwhelm your reader before they even start, so take a look at how your content visually shapes up in a way that invites a reader in, not away . One of the biggest ways to break up a wall of text is through sections. Not only does it help you get your point across in well-defined subsections, but it looks and reads better. You can see here how I’ve categorized my checklist by Content, Formatting, Optimization, and Final Steps. This makes the long list of 16 items more digestible and easy to scan if someone is looking for specific information. Humans are visual creatures, so appeal to them with images, photographs, and graphics that tell the story of your content. The amount of images within a piece depend on the length, but they are always a given. If you don’t have a designer to work with, look at free stock sites like Wikimedia Commons or Unsplash. Adding images is just the first step. Now you have to optimize your images smartly to give them more legs online. Since search engines can’t “see” your image like humans do, they have to go off the information that is available to them: the ALT tag and file name. 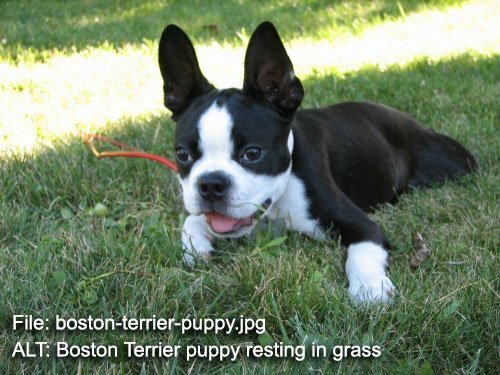 If your image is of a Boston Terrier puppy, then your file name should be boston-terrier-puppy.jpg and the ALT tag the same or more descriptive (“Boston Terrier puppy resting in grass”). This gives your images a fighting chance of being indexed and showing up in mixed search results or Google Images. Links are the currency of the Internet. Links are a way to lead readers to relevant content on or off your site. Internal links move people to your own content for more information or possible product and service content. External links can point to source material off of your site or really great articles that will help readers dive deeper into the topic. Depending on the site infrastructure where your content is published, the category and tags will vary. Make sure you know guidelines before you check any boxes so you are in line with the site’s SEO and taxonomy best practices. I often like to think of these items like funnel, with the category at the wide end of your topic and the tags at the narrow, more specific end. One category and multiple tags is a common practice. Remember, the best title and meta description may not be the best fit for Google, literally. Make sure they fit into the space on Google’s search engine results page because font size changes took place in 2014. A rule of thumb to follow is to keep your title under 55 characters or less and the meta description at 155 characters or less. Either way, always check with a tool like Moz’s Title Tag tool. Is my post slug appropriate? Your URL matters too! CMS systems often auto-generate these slugs, but you always want to make sure yours is what you want. Also, if you change your title mid-production, make sure you go back to revise your URL structure to reflect those changes. Don’t unleash your content until you’ve seen how it will look live. It’s very easy within a CMS to preview your content, so take advantage of this feature to do a final look over. If you have a set time and day to publish your content, schedule it right away to get away from accidentally publishing your draft. If you don’t know when you are publishing yet, look into what times and days work best based on hard data. Last but not least, do you know what is going to happen after you press “Publish?” Have some sort of plan in mind, so once your content goes live, you can pull in as many eyes as you can. Follow these 16 steps or add your own to create an exhaustive checklist that will guide all of your content efforts.